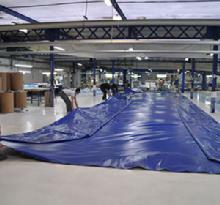 There are over 140,000 pools equipped with liners or protections manufactured by us. Albon has an extra-ordinary expertise in to-measure solutions, and maintains a flexible industrial tool that makes it possible to manage all types of production perfectly. Every year, 2 million m² are produced by our factories, but every item produced is unique! Our teams, who have been with us on average for 9 years, have the exceptional know-how which is the key to quality products and services. There can be no successful production without highly qualified and regularly trained staff. to keep an eye on children around pool.